moving mountains: Up the mast. 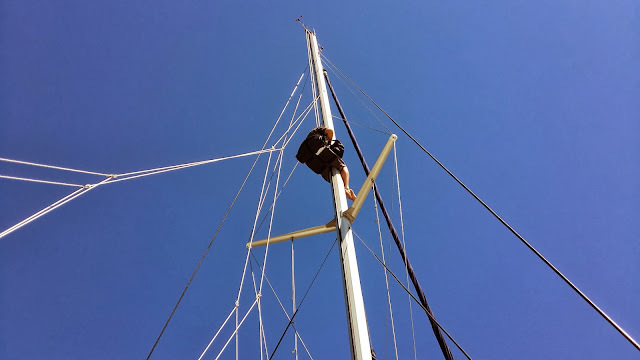 When John from Nance and Underwood was here putting on the deck hardware for our main halyard, we did a test raise of the mainsail to make sure everything lined up. When we went to drop the sail, it kind of stuck on the track, and I had to yank it to pull it down. 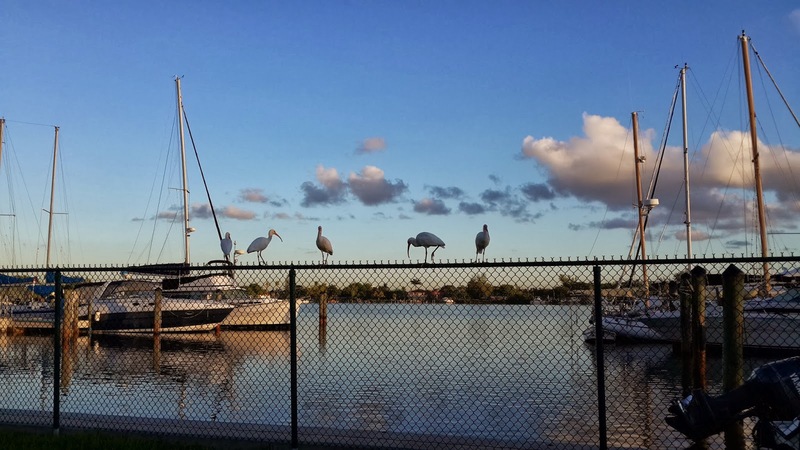 So John suggested we consider lubricating the mainsail track. Now, the way he suggested doing this was to get some spray lubricant and the next time we raised the sail, just spray the cars as they went by, and allow them to drag the lubricant up the mast. But I saw it as an opportunity to go up the mast, clean the track well, and lubricate it on the way down. That would also give us a chance to practice our "going up the mast" technique. Plus, I wanted to see if I could re-mount the cell extender antenna that apparently used to be up there, since we have a new one on the boat. Our mast is raked back, so I found I had to hang on with my legs to keep from swinging away into space. So, on Thursday, we rigged up our climbing gear and bosun's chair, and up I went. 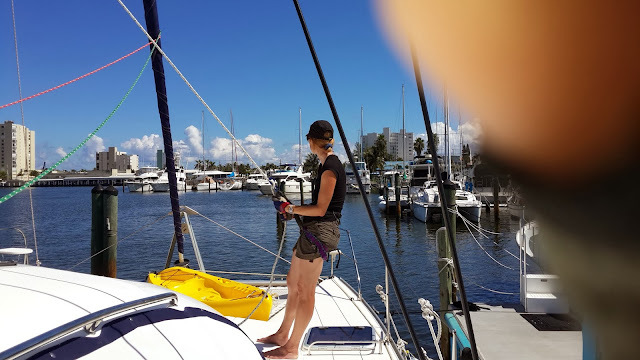 I am not sure how other people do this, but we came up with our own method a couple of years ago when the main halyard snapped on a charter boat we were sailing, and Sara went up to pull it back through the mast. What we do is to have two completely independent systems, so that if one fails, we have redundancy in every piece of gear holding us on. I know this is probably overkill relative to how most people do it, but when you are 62 feet in the air looking straight down at a solid deck, the extra degree of safety is a definite comfort. So, the other day, I tied into the topping lift with my climbing harness, and Sara belayed me on that line. I also used the bosun's chair, and we tied that into the main halyard, and Alexander cranked me up on the electric winch. Sara's belay technique is very relaxed. Checking out the scenery while holding me aloft. Once I was up there, I had a look around, but I couldn't readily see how to mount the new antenna, and it was kind of breezy, so I decided to leave that for another day. I did get a great view though, and managed to clean and lubricate the whole mainsail track. We'll have to see how that works next time we raise the main. I forgot to take the requisite pictures when I was at the top of the mast, but remembered half way down, so if you mentally double the distance to the deck that you see in this picture, you get an idea what it looks like from the top. Halfway up. Sara on belay and Alexander on the winch. Good view of our solar array from here.